When did Frida Kahlo develop a passion for painting? On September 17, 1925, when she was 18, Frida was involved in a serious trolley accident (as depicted in the film). The accident left Frida with a broken spinal column, a broken collarbone, broken ribs, a broken pelvis, and eleven fractures in her right leg. Also, her right foot was dislocated and crushed, and her shoulder was out of joint. Frida spent a month lying on her back. She was encased in a plaster cast and enclosed in a boxlike structure. She began painting to pass the time while healing in bed. It became her lifelong passion. How many operations did Frida have in an attempt to alleviate her pain and suffering? Frida had 32 operations in an attempt to quell some of her lasting pain from the accident. She lived with bouts of pain and discomfort throughout her life, and was often bedridden and or hospitalized for periods of time. In addition to the operations to alleviate her pain, she also wore different kinds of corsets and was subjected to mechanical "stretching" systems. When did Frida's lifelong physical suffering actually begin? Frida's physical suffering began when she contracted polio at the age of five. As a result, the illness caused her right leg to appear much thinner than her left, and it remained that way permanently. Why did the real Frida give her birth date as July 7, 1910, contradicting the July 6, 1907 birth date on her birth certificate? 1910 was the year of the outbreak of the Mexican Revolution. Frida wanted her life to begin with the modern Mexico. Was Frida Kahlo really a bisexual, as shown in the film? Yes, she was. 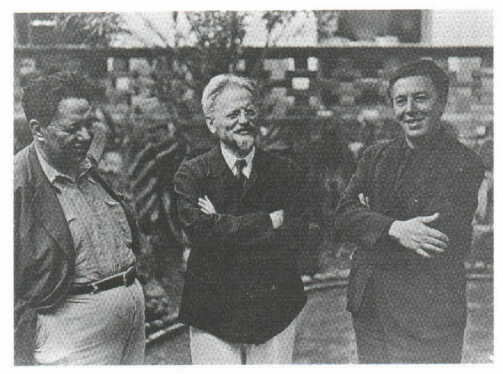 Frida had many lovers, both men and women, including the communist, Leon Trotsky, played by Geoffrey Rush in the film. Like in the movie, in real life Frida Kahlo had several rumored love affairs with women, including the famous actresses Dolores Del Rio and Paulette Goddard. She was also involved in affairs with the wife of the surrealist poet Andre Breton and the famous artist Georgia O'Keeffe. Frida was quoted saying the following about her relationship with Georgia, "O'Keefe was in the hospital for three months, she went to Bermuda for a rest. She didn't make love to me that time, I think on account of her weakness. Too bad." Why did Frida Kahlo paint the way that she did? Frida is often classed as a surrealist, and she had no special explanations for her methods. She said only: "I put on the canvas whatever comes into my mind." Her self-portraits often shocked the public, and included paintings of herself with her hands cut off, as a wounded deer, and another with herself coming out of her mother during her birth. How much have Frida Kahlo's paintings sold for? Frida's oil on panel painting titled Portrait of Christina, My Sister (1928) was auctioned at Sotheby's for $1,655,750. What is the story surrounding Frida's cremation? I don't know if this is true, and I'm not sure if anyone does know for sure, but legend has it that when mourners gathered to watch Frida's cremation, a sudden blast of heat from the open incinerator doors blew her body bolt upright. Her hair was on fire from the flames, and blazed around her head like a halo. Frida's lips appeared to break into a seductive grin just as the doors closed shut. Thus, she gave her audience one last shock. What happened to Diego Rivera after Frida Kahlo's death in 1954? 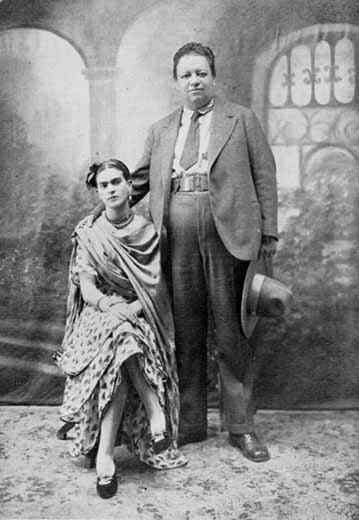 It is said that Frida's husband, Diego Rivera, ate some of Frida's ashes after her cremation. A year later in 1955, Diego married Emma Hurtado, his art dealer since 1946. 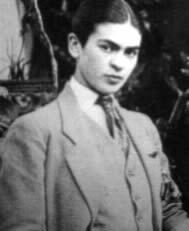 Diego set up a trust fund to provide for the administration of Anahuacalli and Frida Kahlo's Coyoacán homes as museums. At age 70, Diego Rivera died of heart failure in his San Angel studio. He is buried in the Rotonda de los Hombres Ilustres at the pantheon of Dolores, Mexico City. Where are the original Frida Kahlo paintings? Many are in museums. Frida's painting depicting her birth ("My Birth," 1932) is owned by Madonna. Is there a religion today that worships Frida Kahlo? My research has led me to conclude that this so called religion known as Kahloism originated online, likely first appearing on Kimberley Masters' now defunct web site, which included the credo of Kahloism. Basically, it came from the imagination of a die-hard fan (Masters). Kahloism can more simply be interpreted as the adoration of Frida Kahlo. The photograph was taken by Frida's father on February 7, 1926 as part of a series of family photos taken on that day. Frida donned the outfit to shock her highly conventional family. The photograph at left was taken on Frida Kahlo and Diego Rivera's wedding day, August 21, 1929. They would divorce in 1940, only to remarry a year later. Contains over 30 images of the artwork and photos of Frida Kahlo, from themeworld.com. Flash Movie - "Frida e-motion"